On the Main Line: Shadal series #8 - To what does "Nothing Jewish is Alien to Me" refer? Shadal series #8 - To what does "Nothing Jewish is Alien to Me" refer? People say that Franz Rosenzweig said "Nothing Jewish is alien to me" (Google rosenzweig "nothing jewish"), and perhaps he did. This was a play on a famed quotation from Terence (Terentius) "Homo sum, humani nil a me alienum puto" - "I am a human, I hold that nothing human is alien to me." As you can see, the motto of this magazine from Plainfield, New Jersey is "I am Jewish," etc. This is dated 1898. Shadal's letter, from 1842, was printed in the second volume of Igrot Shadal, published in 1894. However, we should not be misled in assuming that the magazine got it from Igrot Shadal, because it existed for a few years before 1894. Writing in 1892, a book about evangelism to the Jews explains that "Die Zeitschrift "Peculiar People" aber, an welcher auch Lucky, ohne seinen Namen zu nennen, mitgearbeitet hatte, wird von dem Sabbatharier Rev. William L. Daland (Westerly, Rhode Island) unter dem Motto: "Judaeus sum, Judaici nihil a me alienum puto" fortgesetzt." This may be before the second volume of the Igrot was published. I say may, because even though the second part was completed in a single volume 1894, it had been appearing in sections first. "Since you mentioned in your letter the Hiddushei Maharsha, I will tell you a new thought I had about the Maharsha this week. 'About the Maharsha? What do you have to do with the Maharsha,' you ask? "I reply, "Judeus sum, judaici nihil a me alienum puto" - "I am a Jew, nothing Jewish is foreign to me." "In Tractate Makkot 3b Rashi writes "if a borrower asks, 'Loan me money on condition that the Shemitta will not cancel my debt. . . " The Maharsha emends this Rashi to read "if a lender says . . ."
"At first though I agreed that this seemed correct, since it would be the lender who would need to say to the borrower "I loan it to you for ten years, on condition that you cannot default claiming that the Shemitta [which occurs every seven years] cancels it." But this explanation is difficult for me, since it seems to me that we should not ascribe this to a copyist's error. While it's possible that a scribe wrote "borrower" instead of "lender" (in Hebrew the difference is the addition or omission of a single letter), but to add the word[s] "loan me" would have to be his own invention, and this is uncommon [for a scribe to add something, rather than merely omit a letter by mistake]. So without another option, I said that Rashi did not write carefully due to haste. After that I thought, that perhaps he was old at the time, and his strength had waned, since when he reached page 19 of Tactate Makkot [it is written that] he died. After that I changed my mind and returned to Rashi's side, because his words seem to me to mean the following: in truth it is the borrower who needs to make this condition, not the lender, for the pauper required the sum for ten years and it is he who requests the loan. Because of the Shemitta, he would need to stipulate to the wealthy man that he will wave his right to the Shemitta cancellation of all debts. Then I considered that the requirement of release falls onto the lender (Deut. 15:2), not the borrower. Then my eyes were opened and I noticed that the language of this passage of the Gemara says "on condition that the Shemitta does not cancel it to me" meaning "that you should not cancel it to me." Rashi found himself compelled to to explain that it was the borrower who said this to the lender, for the lender is unable to say "on condition that the Shemitta should not cancel it to you," he could only say "on condition that the shemitta should not cancel it to me." Thus was Rashi blessed, that to the end of his days his words were pure, and they require study and exactitude. I said to myself, see how far a critic must go in moderately assessing something before passing judgment on the words of God-fearing men, who do not write their books in haste, for financial reward, or for honor. They write constantly to pursue the truth or that which is good." 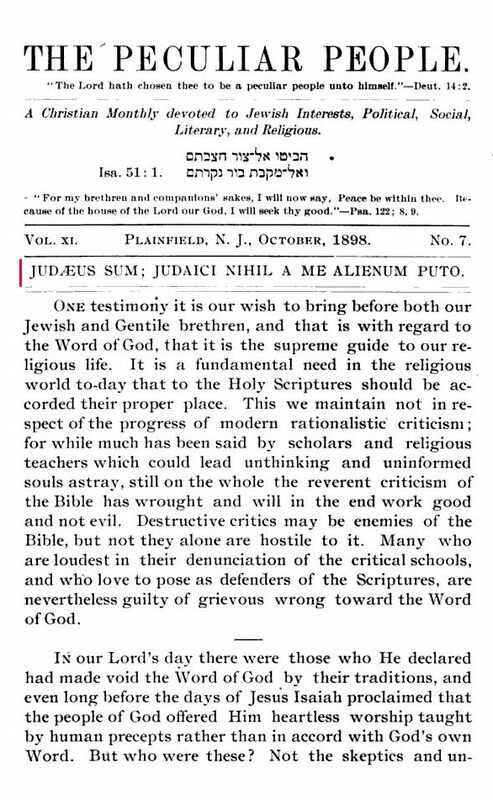 And before anyone says anything, yes, I am aware that he is acting like he discovered America, while this is, at least in theory, the way a Talmudist is supposed to read Rishonim and do this all day every day. However, Shadal's point here was that he of course knew that no one would have thought that he spent his spare time learning Gemara with Maharsha. In reality he was someone who went through Shas in 18 months beginning at age 16, and it is pretty clear that he knew his way in the sea of Talmud, even if he had instrumental motives for studying it - for example, he could not have written his grammar of Aramaic without becoming totally familiar with the language of the Gemara, and he could not have become familiar with it without studying it. Also, throughout his writings he exhibits a very great broadness in all types of Jewish learning; he quotes the Bavli, Yerushalmi, Tosafot, Rif, Tur, Zohar, She'elot u-teshuvot, and much more. While one imagines that this meant that he knew when, how and where to look things up when he needed to (like most scholars) it is apparent that he was no stranger to the traditional canon. All in all, this is a most interesting aside and it appears to be the origin of the saying ascribed to Franz Rosenzweig (and others): "I am Jewish, and nothing Jewish is alien to me." It was written by Shadal in 1842 to explain to someone that they shouldn't be surprised that he knows the Maharsha. It's a very good vort in Rashi. I remember its clear he (Shadal) must have been learning Makkos, because just one or two letters beore or after this one, i dont remember at the moment, he has another good one also in the first perek of Makkos. Are you familiar with the postmodern version of the expression? "Pomo sum, pumani nihil a me alienum puto." he knew a lot of Kabalah as well. I'm not sure Rosenzweig took it from Shadal. Terence's phrase just offers itself for variations and parodies, so that I shouldn't be surprised if all the time somebody thinks of "I'm a Jew, nothing &c." for a parshe sheet in mid-west shul or something. Long ago I used the phrase "nothing Jewish is alien to me" in a letter to my uncle, before I had any idea that Shadal or Rosenzweig had preceded me. Baruch she-kivvanti. Of course, some wouldn't refer to Terence in a droshe, because they hold that "nothing alien is Jewish to me". The Orthodox Frankfurt society that hired R. S. R. Hirch to be its rabbi was not "separatist." It is interesting that the cultural and religious hero of both Shadal and Rosenzweig was Judah Halevi. 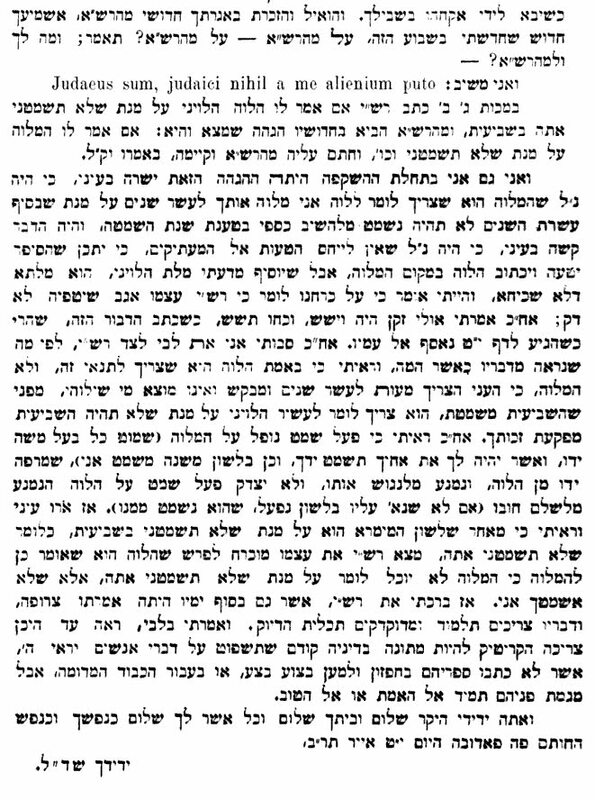 I should point out that Benamozegh cites and discusses the Maharsha in the very first verse of Genesis, in his Chumash Em Lemikra. I happen to be writing a paper on Shadal's position on the reasons for the commandments, and wrote a footnote on this quote last week. I wrote "His saying, “iudaeus sum, iudaici nihil a me alienum puto,” frequently cited as a motto or even as “Luzzatto’s favorite dictum” (Rosenbloom, p. 18), was almost certainly not so. The context of the quote is Luzzatto’s defending himself against potential surprise at a note of his on a comment of Samuel Edels, as Shadal was not known for his interest in Talmud. It was simply a cute pun on Publius Terentius' quote that Shadal probably never used more than a few times, if at all outside this letter." I have not been able to find another usage of this quote in Shadal's writings. Same thing with "אכתוב דברי ואם לא יהיה הדור כדאי להם אניהם לאדם שהיה אחרי והוא יוציאם לואר אחרי מותי," which was included as a motto in Igrot Shadal. A lot of writers make a big deal about it, but it was simply selected from his writing by [Graber, or Kaufmann, or perhaps Isaia Luzzatto). Did you create this website yourself? Please reply back as I'm wanting to create my own personal website and would like to find out where you got this from or exactly what the theme is called. Thanks!